The Pope later tried to claim it was “protest art” but only after a backlash. Notice he also has a chain around his neck with the insignia on it. Morales made sure he could not simply hand off the symbol to an aide. 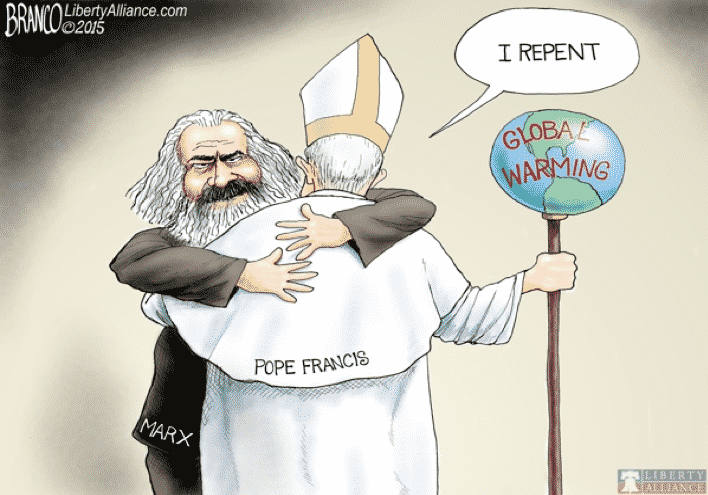 When you examine the Pope’s involvement with the global warming issue, you understand why the charge that he is a Marxist has credibility. The situation was not missed by cartoonists, the most astute observers of society (Figure 2 below). 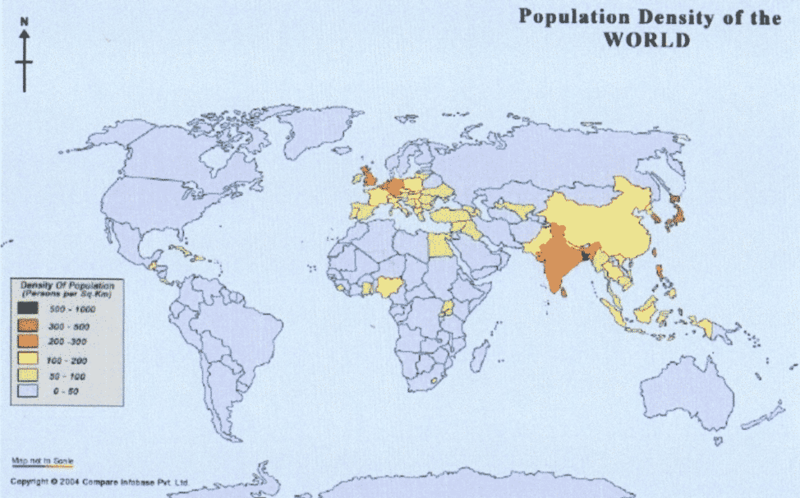 The problem is the proposed solution to anthropogenic global warming (AGW) is a reduced and globally controlled population, which are the antithesis of the Catholic credo of ‘go forth and multiply’. “Is the Pope Catholic?” was a reliable truism until Pope Francis was elected. Now, many believe it is not true because of his actions. First, let me make clear that there is a difference between Christianity and the Catholic Church, and it is essential to understand the difference to understand what is happening. The problem is common to all things in society because everything from a book, to a business, to a country, to a religion starts with an idea. If the idea is to gain traction, it always needs an organized structure to spread and maintain it. Invariably, however, the structure becomes more important than the idea and then both begin to fail. It is occurring in the US as people realize they have drifted too far from the original idea set out in the Declaration of Independence and the Constitution. The structure, government, has become bigger than the idea. The Catholic church is a structure that many people believe was necessary to disseminate and control the faith. It gradually became more important than Christianity, until Martin Luther called for a reformation, a return to Christianity in 1517. It drifts again today, as the Pope’s actions underscore. Pope Francis began advocating the global warming (AGW) agenda of the UN Intergovernmental Panel on Climate Change (IPCC), with the help of the Obama White House. It is hard to believe he didn’t know their ultimate objective was to reduce and control population, which contradicts Catholic doctrine. The irony is that as a Jesuit, the ideological church police, he should know, but apparently, his personal, political and economic perspective trumps it. He also doesn’t appear to know that population control comes naturally with industrial and economic development. He was aware that his connection to the Jesuits was a handicap. He is the first Jesuit in history to become Pope. Despite that, he took the name of Francis to align himself with the most socialist of saints, Francis of Assisi. He was one of the wealthiest people of his time and with a grand gesture gave everything away and wandered around in a brown robe with bare feet administering to animals and the poor. The ideal image for Jorge Mario Bergoglio, but not for a Jesuit Pope. Coercion of the Pope to the global warming message began during the Obama era when John Kerry visited the Vatican, reportedly to discuss Middle East issues. Most Americans think Kerry is an Irish Catholic. In fact, the Kerry family came from a small town that is now part of the Czech Republic. The New York Times reported that before emigrating to America, the Kerry’s changed their name from Kohn and converted from Judaism to Catholicism. The Obama administration cemented the connection and involvement of the Pope by sending the top bureaucrat of the Environmental Protection Agency (EPA), Gina McCarthy, to the Vatican. McCarthy said the purpose was to confirm for the Vatican how aligned President Barack Obama and Francis were on climate change. That is, global warming isn’t just an environmental issue but a public health threat, and an economic opportunity. 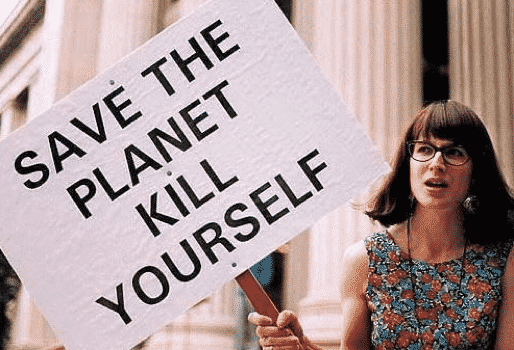 The claim that human-caused global warming was destroying the planet came from the Club of Rome (COR), who took the Malthusian idea that world population would outgrow food resources and expanded it to all resources. Their 1972 book, Limits to Growth, anticipated the method used for IPCC Reports. It used simple linear trends for population and resources to project global exhaustion and catastrophe. They used computer models to create the illusion of scientific accuracy. Just like the IPCC, all their predictions. The argument was twofold. Pressure on resources was occurring by natural rates of population increase, and developed nations were using the resources at an accelerated rate. The goal was also twofold. Reduce population overall and reduce industrialization that caused the increased demand on resources. He called “simplistic” the belief that large families were the cause of poverty, blaming it instead on an unjust economic system. And there it is, an anti-capitalist agenda hiding under the guise of caring about the poor. What is the Pope’s economic policy? The answer is, the economic redistribution of wealth by the government, or socialism. Now the quote parallels what Pope Francis is identifying in his Encyclical “Laudato Si.” Global warming is a front for a broader, anti-capitalist, anti-developmental, total population control agenda. The Encyclical is a diktat from the Pope, the person who is claimed as infallible by the Church. What is not widely known are the people the Pope used to help him draft it. Ironically, this is a form of atheism that would create another religion similar to Animism, the worship of nature. This parallels the concept of Gaia, another pseudo-religious exploitation of environmentalism. Schellnhuber believes global warming will solve overpopulation. In Copenhagen in 2009, he said that a 9° F (5°C) rise in global temperature would devastate the Earth’s population. The other person the Pope selected to help him prepare the Encyclical was Naomi Klein. Here is how The Guardian described Ms. Klein. The combination of Schellenhuber and Klein guaranteed a revolutionary Encyclical because Pope Francis accepts that overpopulation and AGW are dangerous enough to supersede fundamental Church doctrine. The Encyclical promotes the same claims and solutions as UN Agenda 21. This includes a transfer of wealth as required by the Kyoto Protocol and its replacement, the Green Climate Fund, approved at the Paris Climate Conference. Like the IPCC, the Encyclical uses global warming as justification for a political agenda. The problem is the political agenda contradicts fundamental traditional Catholic belief and teaching. The church always fought against birth control and abortions. A lawsuit filed in New York just a few years ago saw the Church suing the UN and the White House over these issues. Paul VI starts with the false claim of the threat of overpopulation. This is an interesting position taken by men who will not allow women to be priests and practice the most unnatural behavior of celibacy. As a defrocked priest friend of mine, now married told me, I laugh when I remember, as a single, celibate priest, counseling couples about marriage. Of course, the Church has continuosly imposed or removed the celibacy rule throughout its history. The Catholic church has little to do with Christianity. As George Bernard Shaw said, Christianity is the greatest thing in the world. It is just a pity nobody ever tried it. 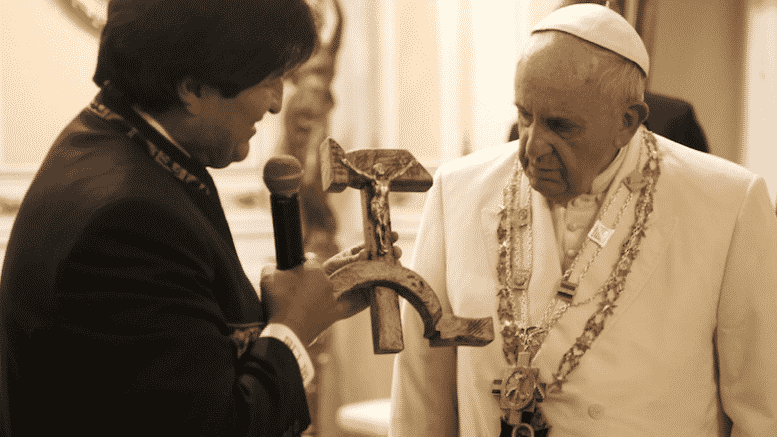 Pope Francis is making sure as a Marxist that nobody will try it. He is making the new religion of environmentalism and global warming the opiate of the masses.